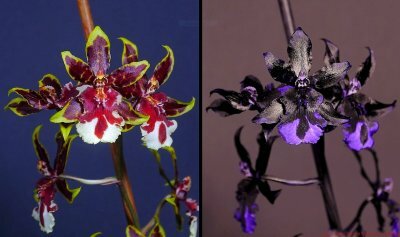 Today shots of an Orchid hybride, Oncostele Wildcat 'Golden Red Star' in reflected ultraviolet photography with a UV-Nikkor f4.5/105mm lens. UV filter used was the Baader-U filter, my "work horse" filter for reflected UV. All shots were done at f8 for the UV-Nikkor. Light source used was a modified for high UV output Xenon flash.